Provincetown, MA, is bursting with exciting things to see and do day and night. Shopping, dining, lively entertainment and sightseeing are just a few of the things you should enjoy during your stay. Some of the most scenic spots to visit are the lovely white sandy beaches in Provincetown, MA. Whether you only have time for a brisk walk on the beach, have all day to lounge on a warm sunny day, or want to watch a romantic sunset with your sweetheart, you’re sure to enjoy your time spent on some of the most beautiful beaches on Cape Cod. The beaches and surrounding water are an undeniable part of any Cape Cod experience. As you make your way to Provincetown along the 70-mile long peninsula, the scenic route includes glimpses of the Atlantic Ocean to the east and Cape Cod Bay to the west. Once home to countless whaling fleets, this sliver of land has become a sanctuary of sorts for those who want to escape city life to relax and recharge. In order to preserve the natural beauty of the area, President John F. Kennedy had the entire Atlantic Ocean coastline of Cape Cod designated as a National Park in 1961. There are two main beaches in Provincetown, MA, Herring Cove and Race Point Beach. Drive, bike or take the shuttle to either of these beaches as part of an incredible stay on Cape Cod. As one of the best places to watch the sunset in Provincetown, Herring Cove Beach is situated on Cape Cod Bay and offers calmer and warmer waters perfect for splashing around in the summer. It’s about a 10-minute drive from Admiral’s Landing bed and breakfast or about 30 minutes if you bike. You can pick up a few drinks and snacks on the way or you can purchase refreshments from Far Land Provisions (cash only) at the beach when hunger and thirst strike. Upon making the short walk from the parking lot, you’ll quickly understand why Herring Cove Beach was once voted by the Travel Channel as one of America’s Best All-Time Beaches. It’s the perfect place to stroll hand-in-hand with your love, relax on your towel and soak up the sunshine or splash around in the water like a kid. Located on the Atlantic Ocean, Race Point Beach offers miles of lovely sand to explore and is one of the best places to watch the local sea life. Don’t be surprised if you see seals frolicking in the water just offshore as well as an array of beautiful shorebirds. Ranked at No. 6 on the Travel Channel’s list of the country’s most beautiful beaches, you’ll find this stunning landscape has dunes that are a bit steeper to traverse than Herring Cove Beach. The water is also a little rougher, so take extra precautions when you head out for a swim. Even though Race Point is on the Atlantic side, the sunsets are still incredible and well worth an evening trek to the beach. 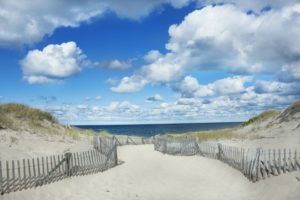 Driving, biking and the shuttle bus are the three main modes of transportation to the beaches in Provincetown, MA, and there are just a few things to keep in mind. You may need to pay an entrance fee to park. Options include a day pass or a season pass that you can then use at any National Seashore beach. The season pass is the best bet for those who are staying in the area for several days and plan to spend plenty of time at the beach. You can rent a bike at several locations by the hour, day or week. Ptown Bikes and Arnold’s both offer a nice selection of bikes and are close to Admiral’s Landing. Pack a backpack with plenty of water and a few snacks and bike on Ptown’s paved bike trails to either beach. If you’d like to be completely foot-loose and fancy-free, take the CCRTA shuttle bus. In the high season, the bus runs every 20 minutes and will take you right to the main parking lot of each beach. When you’re searching for the perfect place to stay during your visit to Cape Cod, look no further than Admiral’s Landing. Our 1860s bed and breakfast offers a central location so you can enjoy all that Provincetown has to offer. Each of our guest rooms at this Provincetown hotel includes a variety of deluxe amenities, including fireplaces, complimentary Wi-Fi and a delicious homemade breakfast every morning! This entry was posted in Cape Cod Beaches, Things to Do and tagged Beaches in Provincetown PA, Things to Do in Cape Cod by Admirals Landing. Bookmark the permalink.